QUAKETIPS: Where should I keep that emergency kit? I get asked this a lot, and it’s a great question. Should it be by the front door so that you can grab it on your way out if you have to evacuate (AFTER the shaking stops)? Should it be in the deepest depths of your home so that if you are physically stuck in there and can’t get out through doors or windows, you’ll have supplies while waiting to be freed? Should it be scattered around all of the rooms in your home so that you won’t be without supplies no matter where you might get stuck? Or how about outside your home, so that if you leave the building (again, AFTER the shaking stops) and are not allowed back inside, you’ll still be able to get your supplies? Alas, there is no single perfect strategy. The bottom line is that for any place someone puts a kit, I can come up with a scenario in which it was the wrong place. 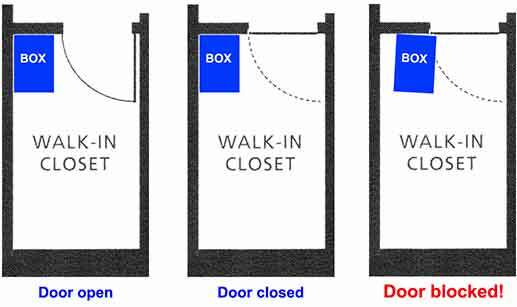 For example, an outside kit doesn't help in the unlikely event that you are physically stuck inside your home for a while, and an inside kit doesn't help if it's inaccessible after something fell on it or you are away during the quake and are not allowed into your home. Ours is in a closet; if we can't get the closet door open, it's not going to help; but it was the only place that made any sense in our condominium (more on this in a minute). Since the most likely scenario for needing an emergency kit consists of you and your home being perfectly fine but the stores are closed for a while, I tend to go with whatever works best for the contents of the kit, while keeping access in mind. I think if you have a free-standing house and a well-protected and secure storage place outside like a sturdy garbage bin, at least there's less of a chance that it will be inaccessible, assuming you are not stuck in your home. However, it will be more exposed to the elements, so food supplies probably won't last as long after cumulative effects of hot days as they will last in a nice cool closet on the floor. For that reason, I'd probably feel better with it indoors, but it's a personal choice. Plus, you’d better take measures to ensure that your supplies don’t turn into a litter of baby raccoons. And some people ARE stuck inside their homes after a damaging quake, although this is probably more of a problem for apartments and condos with only one door and perhaps windows that don’t lead anywhere except 7 stories down, so those people probably don’t have a good outside storage location anyway. You may have a parking garage storage locker, and then you still have heat or mildew as potential problems. The exception is water. The recommended amount is a gallon of water per person per day for 3, 5, or 7 days depending on who’s talking (I shoot for 6-7 days). In a couple of places I’ve lived, there was an outdoor storage locker in the parking garage and most of the water was stored there due to limited indoor storage space, with two gallons in the apartment stored in the closet. Here’s an example of what I mean about nothing being perfect, which I like to pull out when people ask me this question. In our previous apartment, we had a walk-in closet that was really the best place for our emergency kit from a practicality standpoint. We have a rather large portable kit and another Xerox box full of MREs, cans, and other supplies; and it is pretty heavy (photos are at my main earthquake preparedness website; click on the first photo gallery called “Basic precautions”). The only place that really worked out with our otherwise-jammed-to-the-brim organization was to put it on the floor right inside the closet near its door. 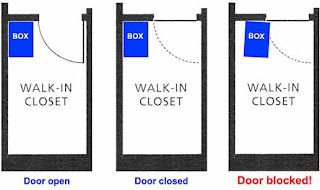 You can see in the floor plan figure that the box just cleared the moving edge of the door. Well, one day I realized that if the heavy box slid over just a few inches in an earthquake, it would block the door from opening and I would not be able to get to the kit! I’m embarrassed to tell you how long it took for me to notice that… but lesson learned. However, there was really no other place to put it that made sense, so I wedged a couple of door stops under the outer edge of the box so that if it started to shake, it would have less ability to move away from the wall. By the way, this is also worth keeping in mind when deciding where to store a person. My office at work is a windowless room with a door that opens outwardly. There’s a desk in the outer room that is against the wall near my office doorway, and we realized that in the unlikely but possible event that the desk moved in a quake to block the door, I’d be trapped. So we had the desk bolted down to the floor! And don't forget a few supplies in your car and at work, since you might find yourself stranded at work with no way to get home after a quake, or stranded in your car in various other circumstances. At any rate, you could argue that at least the portable kit should be right next to the front door so that you can grab it as you evacuate in an emergency, but if you really think about it, it’s a pretty unlikely circumstance that an earthquake in a place like California will be reason to run out with urgency. As this blog has discussed before, it is not recommended to run out of a modern building during an earthquake because you have more of a chance of being injured by things falling off the outer walls than if you simply take shelter under something sturdy (NOT next to something). If you decide after a quake that the building is unsafe for continued occupancy, then you have that extra few minutes to get your kit from its storage place. If there’s no earthquake but a fire is about to engulf your home, then at least in most such cases, you’ll be in a relatively small number of people affected and the emergency kit will not be all that crucial to you. So in a large earthquake, my own take is to try to make the kit accommodate your home’s set-up rather than the other way around. Basically I prefer to try to eliminate the 99% of the things that can go wrong, take steps to minimize the problems that could result from a remaining 0.9%, and not fret too much about the few things that could theoretically still go wrong. This is why we don’t take parachutes with us when we fly a commercial airline. We take precautions, like flying on reputable carriers, perhaps knowing where the nearest emergency exit is, and knowing that if we see a guy in the seat next to us attempting to light his shoe on fire, tackle him first and ask questions later. But we are resigned to the fact that if the 0.001% (or whatever) chance comes true that the airplane is going down, then oh well. Notice that I managed to get away without actually telling you where to keep your emergency kit. But the main point is hopefully clear: make it a place that it will be safe and well-preserved, accessible in the context of your own home, somewhere that you will remember, and I might also add that if it is too inconvenient to access, then you will be less likely to check it every year or two and replace things that have expired. Based on all of these considerations and your own personal situations, you should be able to come up with something reasonable. Thank you this was very helpful for me. It is clear that there is no one proven method but rather it depends on your individual circumstances.